← Nipping Skynet in the Bud? Killer Robots and Real Life Warfare. The TL/DR Synopsis Synopsis: The story of a curious episode in which one of the famous Enigma encryption machines was stolen from a museum, eventually being recovered from a mysterious figure who called himself The Master. The Master’s messages to the police were thought to contain coded clues. Includes links to: (a) numerous news reports about the theft, investigation, and recovery of the Enigma, and (b) links regarding the Dali painting that inspired the title for the post. 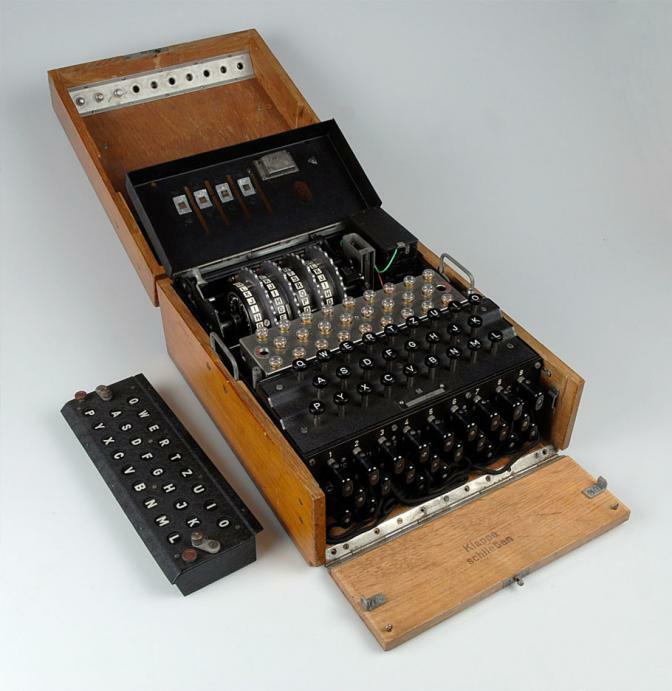 In World War II, the Nazis used an ecnryption device called Enigma, whose codes they thought were unbreakable. A British team at Bletchley Park, led by Alan Turing, broke Enigma, which gave the Allies undiluted access to German orders and intelligence. The breakthrough has been estimated to have shortened the war by as much as two years and Churchill said that Turing made the single biggest contribution of any individual to the Allied victory. I’ve been interested in Turing for more than a decade, which is one of the reasons that he turned up in a fictional guise in my novel Luck and Death at the Edge of the World (or an artificial intelligence emulating him did). Mine isn’t the only fictional tale in which Turing has guest starred. Among others he’s appeared in Rudy Rucker’s Turing & Burroughs: A Beatnik SF Novel, in Christos Papadimitriou’s Turing, A Novel About Computation, and in Greg Bear’s award-winning short story “Tangents” (collected in the book of the same name). One of my current projects is a review of Turing’s fictional appearances entitled Conjuring Turing: the Fictional Afterlife of Alan Turing–Rucker, Papadimitriou, and Bear have all agreed to participate. Authors I haven’t signed up yet include Neal Stephenson for his novel Cryptonomicon and Janna Levin for A Madman Dreams of Turing Machines. All of which is a way of introducing an entertaining little anecdote. This is one of the stranger tales I’ve come across involving the famous Enigma code machine that occupied so much of Turing’s time. On April 1, 2000 someone pulled an April Fool’s heist, stealing one of only three Enigma code machines in the world from the Bletchley Park Museum. The Abwehr Enigma G312 machine was valued at £100,000. Police believed that the machine had simply been carried out of the historic site, but don’t blame Bletchley Park. The theft resembled a magic trick–the Enigma machine was secured in a glass cabinet which was not broken in the theft. An alarm system was in use and volunteers were watching over the site’s displays. Whoever carried out the theft was either very lucky or, more likely, very professional. And they may have had a man inside because the theft happened just a week before a new infrared security system was to be installed. If that sounds like a movie, just wait. What had happened to the machine was a mystery for several months. Then, in September 2000, police began receiving letters from a man who referred to himself as “the Master,” who claimed to be acting on behalf of a third party who had innocently purchased the machine, not knowing that it was stolen. The Master’s letters demanded £25,000 for the machine’s return, to be paid by October 6, 2000. Bletchley Park announced that it would pay the ransom and had the money ready, but even as the deadline passed the Master failed to make contact to collect it. 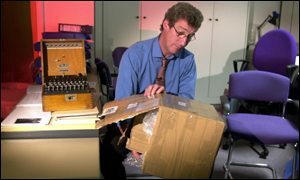 Two weeks later Jeremy Paxman, a television presenter at the BBC, opened a parcel at his office and found the Enigma machine inside. It was missing a few parts, but these were later delivered as well. Ultimately a dealer in World War Two memorabilia named Dennis Yates was charged with “handling” the stolen merchandise after admitting that he sent the letters and delivered the machine to Paxman. Yates was scheduled to stand trial at Aylesbury Crown Court, but decided at the last moment to plead guilty and was sentenced to ten months in jail. In court, Yates said he had become involved in a scheme which soon passed out of his control and that his life had been threatened by persons involved in the theft. He never named the actual theives and they were never caught. Note: The title of this post is an allusion to a painting by Salvador Dali called The Enigma of Desire — My Mother, My Mother, My Mother (1929). Details of its creation and underlying psychology can be found here. This entry was posted in Conjuring Turing: The Fictional Afterlife of Alan Turing, Facts in Fiction/Alan Turing, Luck + Death at the Edge of the World and tagged A Madman Dreams of Turing Machines, Christos Papadimitriou, Cryptonomicon, Greg Bear Tangents, Janna Levin, Neal Stephenson, Rudy Rucker, Turing & Burroughs: A Beatnik SF Novel, Turing (A Novel About Computation). Bookmark the permalink.